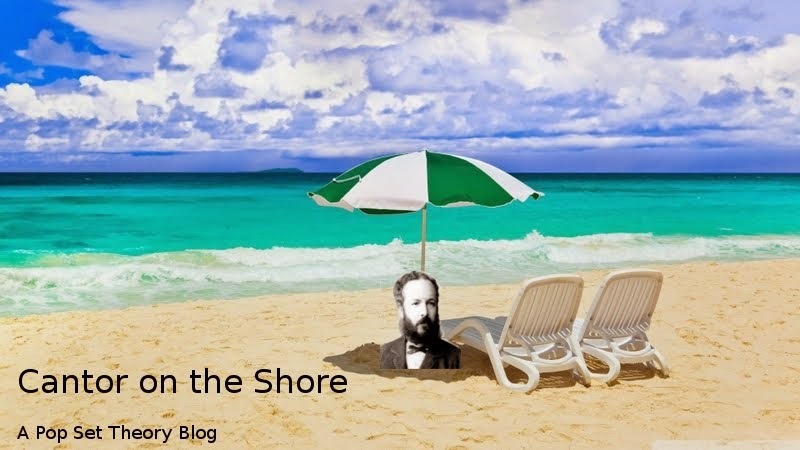 Cantor on the Shore: These are infinities that count! In this cases I think: what does a person that doesn't know what "countably infinte" means feels hearing this? Which images come to the mind? An infinite... you can count? Because in fact "countably infinite" is a pretty specific term in set theory. Something is countably infinite if it is infinite and as big as the natural numbers, or aleph 0. That is, if you can connect every object to one and only one number, the objects are countably infinite. In this way, you can count the objects: object 1, object 2, object 3, ... and this is way is called "countably". One way to do this is a list: if you can write the objects, one every line, without ever stopping, than you have countably infinite. 5. Hey, did you know that there is no word that rhymes with purple? 12. No, no, no this is not related to the first sentence, don't leave! 15. But seriously, how would you say your skin is scaly from 0 to 10? Wait, this is taking too long. Let's do this more systematically. How many thoughts there are, at all? Better: let's count how many sentences one can write. For example: how many with one character? we have the letters (26) and the space (1). Who cares about punctuation. So 27. How many with two characters? 27 times 27, that is 729. And so on. So let's code any sentence with a number: a=1, b=2, z=26, _=27, aa=28, ab=29, a_=54, ba=55 and so on. Think about it: all the words you are seeing are saved in the computer as binary numbers, so of course to every sentence is associated one and one only number, and to every number one and one only sentence. For example: the number 1234567890 is the sentence "ceaantr" (almost Cantor! ), while "I_love_you" is the number 76387629278892. So there are countably infinite possible things to say, one for each number! That's it, isn't it? They didn't really mean infinite things. It was just a way to say "more things that I can say", wasn't it? And I am making a fool of myself meticulously analyzing a simple hyperbole? Blimey! I always fall for this! I... I need time to think. Countable infinity is probaby much, much bigger than what you have in mind. Still, other things are even bigger.